Crystal in the West has long been let people feel the power of her secret. Nature as early as one hundred years to eight million years ago gave birth to crystal, crystal and is a kind of silica, quartz crystal contains beneficial to the human body chemical elements: silicon, iron, titanium and so on. In the Western Roman era on the popular use of crystal power of God for people to change feng shui and wealth and so on. Crystal objects issued by the seven-color light can develop each person's seven can be the center of the ancient Greeks that the crystal is ice according to God's will evolved into a stone, it crystal clear, transparent, flawless, Appreciate the crystal when reminiscent of Clear, pure, without any impurities in the mountain stream, It is refreshing, Some people believe that crystal hidden in the gods, Can predict the future. So, many people like to show the crystal at home. 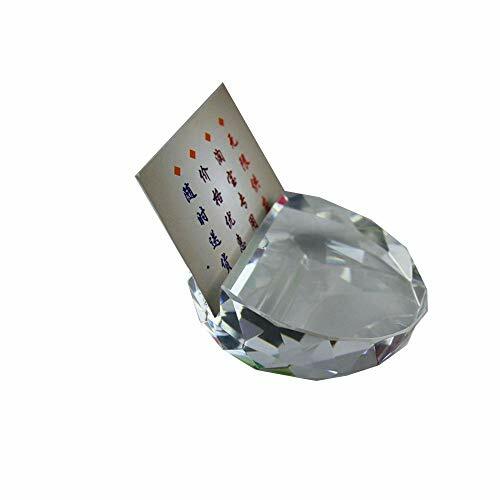 Exquisite crystal Card Holde for a variety of occasions, the company annual meeting, classmates party, birthday party, friends party. Can be used as a memorial gift. The raw material of the product is through our carefully selected high-quality raw materials, does not contain harmful to human health material, better protection and family health. Each of our products are handmade hand-made, concerned about every detail. So they look very fine! If you have any questions about this product by qianyue, contact us by completing and submitting the form below. If you are looking for a specif part number, please include it with your message.